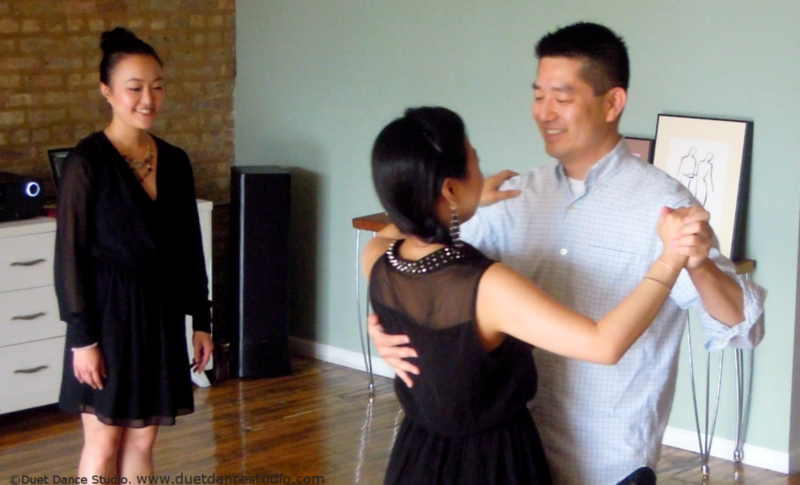 Duet Dance Studio Chicago offers personalized ballroom and Latin dance lessons, wedding dance lessons and adult dance classes. Located in Chicago Wicker Park/Bucktown. There are two things we love. Dance and people. Our instructors are all passionate about dance and eager to share the joy of ballroom dance with people. Before we teach you to dance, we want to learn more about you and how we can help you achieve your goals. Whether you are learning to dance for fun, health benefits or special occasions, we will customize your experience to meet your needs. Have “two-left-feet?” No worries! Our instructors have ample experience working with both beginners and seasoned dancers so you will be in good hands! Both single dancers and couples are welcome. At Duet Dance Studio, we offer Latin and ballroom dance lessons and specialize in wedding dance lessons. We teach mostly private lessons that are tailored to you. But we also offer some group classes and parties, which give you the opportunity to practice your dancing in a supportive social setting before you hit "the real world." Besides the sheer joy of dancing, at Duet Dance Studio, we hope you will experience ballroom and Latin dancing as a creative outlet and a powerful tool to connect with people. Thank you for visiting us. We hope to see you on the dance floor soon! Private dance lessons at Duet Dance Studio. Salsa Dance Class at Duet Dance Studio. Photo by Jeff Callen. Listed as One of the Best Dance Studios in Chicago by Daily Candy.